A five-year research programme aims to develop nontoxic vaccine technologies to complement existing cancer immunotherapies. Professor Gavin Painter from Victoria University's Ferrier Research Institute has been awarded nearly $10M in the Ministry, Innovation and Employment's 2016 Endeavour Fund science investment round to lead a team of fellow investigators from the Maurice Wilkins Centre in developing vaccine technologies to complement existing cancer immunotherapies. Current immune therapy drugs, such as anti-PD1 drugs, work by blocking molecules on immune cells that prevent them from destroying cancer cells. However these drugs don't work in all patients. The aim of the newly funded research programme is to develop nontoxic cancer vaccines that can trigger stronger immune attack on tumours, and enable more patients to get benefit from immune therapy. The five-year research programme will draw on the expertise of chemists and biologists from across New Zealand’s Maurice Wilkins Centre network, with funding split between a number of existing research groups. MWC collaborators. 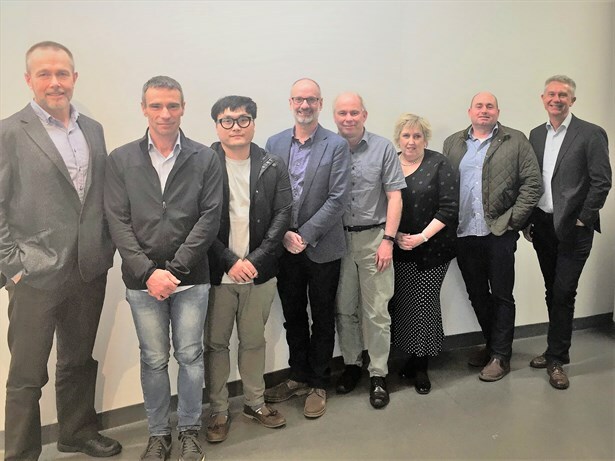 L-r: Dr Geoff Williams (University of Auckland), Prof Gavin Painter (Victoria University of Wellington), Dr Sung Hyun Yang (University of Auckland), Prof Ian Hermans (Malaghan Institute), Prof Dave Larsen (University of Otago), Prof Margaret Brimble (University of Auckland), Dr Greg Walker (University of Otago), Prof Rod Dunbar (University of Auckland). Director of the Maurice Wilkins Centre, Professor Rod Dunbar, said such a major investment in immune therapy from the Endeavour Fund underscores both the potential impact of the research and the strength of the team. Maurice Wilkins Centre investigators involved include Professor Ian Hermans from the Malaghan Research Institute, and Professor Rod Dunbar and Distinguished Professor Margaret Brimble from the University of Auckland. The research will combine their complementary chemistry and immunology skills, and the University of Otago’s drug formulation experience.